So, What Did You Do... Fight A Triffid That Spits Poison And Kills? 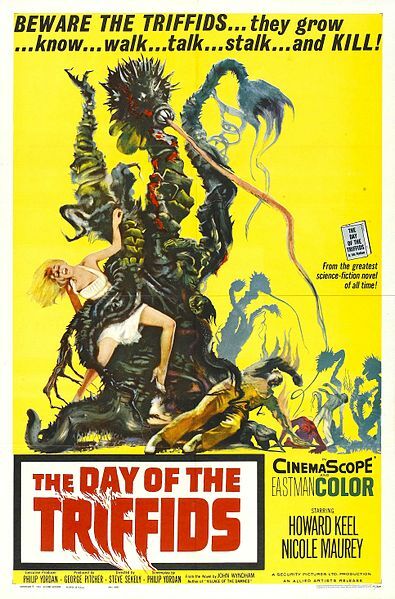 Home Retro Memories So, What Did You Do When You Saw Janette Scott Fight A Triffid That Spits Poison And Kills? So, What Did You Do When You Saw Janette Scott Fight A Triffid That Spits Poison And Kills? Today’s title, of course, pays homage to a different film (Answer appears below. What? You want me to give it away already? ), so here’s hoping you’ve already figured it out. If not, that movie will get its own post soon enough. Today, though, is all about the era of post-apocalyptic atomic disaster films, and the 50th anniversary of a true classic. In 1951, author John Wyndham rose to prominence with his novel, The Day of the Triffids. Though the author, whose real name is—no joke—John Wyndham Parkes Lucas Beynon Harris, had previously published several sci-fi novels under pseudonyms based on his real name, this was the novel that he would become famous for, and is still his best known work. By 1961, a deal was in the works to produce a feature film based on the book, and in 1962 it was released in the UK, where the film was shot. On April 27th, 1963, however, the adaptation reached the shores of the U.S.—where the film instantly became a science fiction classic. Protagonist Bill Mason (portrayed by Howard Keel), is a merchant naval officer who’s recovering in the hospital after an accident has damaged his eyes. While there, a spectacular meteor shower is visible across the globe, with some very unpleasant consequences. The result is an opportunity for triffids, tall, asparagus-like plants with a deadly poison,to—insert spooky music here—take over the world! Like earlier science fiction films that cashed-in on the awe-inspiring power and the unknowns of the atomic age, such as THEM! (1954) and Tarantula (1955), The Day of the Triffids offers a doomsday scenario that still holds up reasonably well today. Much like its radioactivity-leading-to-nature-run-amok predecessors, The Day of the Triffids shows the unexplored consequences of the use of atomic power, and offers a glimpse into just how quickly civilization could collapse in the wake of such a disaster…even if humanity is pitted against plants that can uproot themselves and walk around! With 50 years behind it, The Day of the Triffids is still a fan favorite, and remains well-regarded by both readers and cinephiles. As well, triffids have managed to pop up in a variety of places, including making an appearance as an alien in the Looney Toons cartoon, Back In Action, and if you’re real careful, you can catch a glimpse of one the aliens harvest in the movie E.T. Oh, and of course, the title for today’s post? Well, that comes from the play (and film) The Rocky Horror Picture Show, which refers to the aforementioned Ms. Scott fighting a triffid that spits poison and kills. As for me? Well, I’d prefer a giant ant from the film THEM! If I were outfitting a post-apocalyptic man cave, but I wouldn’t turn down my own triffid.